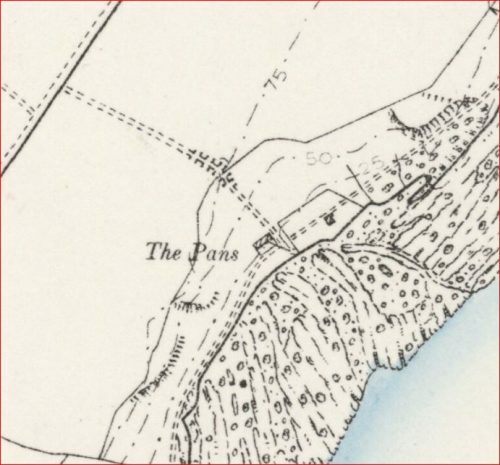 Canmore – names the site as The Pans, Crail – salt works and tile works. Old Crail (Eric Euson p32) The Kirkmay House in Marketgate was built in 1817 for James Inglis who owned the Kirkmay estate. In 1845 it was reported he had formerly operated a coal work on his estate with an engine to keep the workings pumped free of water, but had given up the enterprise. 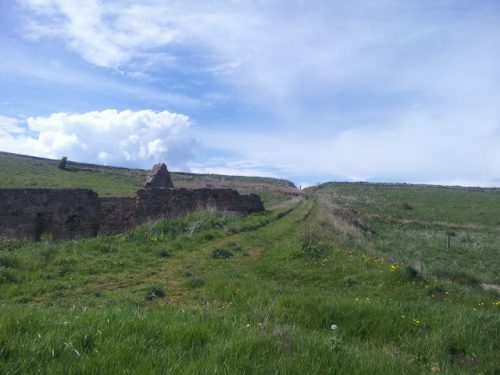 Fire and common clay were still dug in abundance on the estate and fire clay bricks and chimney cans were manufactured on the Kirkmay estate and shipped to Dundee, Arbroath and other towns to a considerable extent. 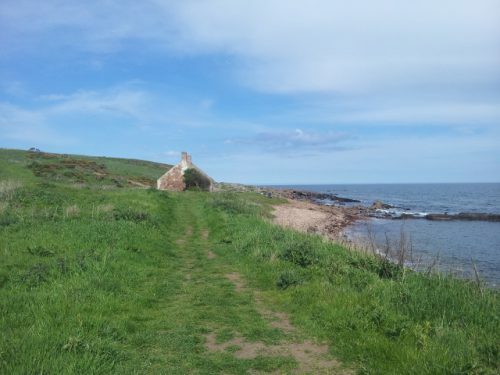 04/08/1827 – The Scotsman – – Crail – since the working of the main seam of coal commenced, works for the manufacture of bricks etc and salt have been set a going on the estate of Kirkmay, which promises employment to many individuals and will therefore be of vast consequence in this part of the country. That these works might be benefited by their maritime situation however it was necessary a place of safety for vessels should be established. 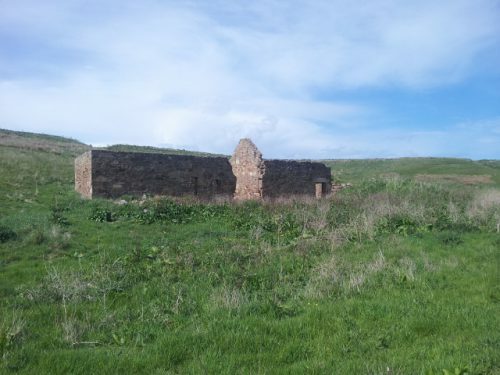 With that alacrity and public spirit which distinguishes the proprietor, a creek immediately behind the salt pans and in the near vicinity of the brick field has been cleared out, drawing at the entrance no less than 28 feet of water. On Saturday last the ‘John and Barbara’ of Crail, John Matthew master, entered and delivered her cargo. When leaving the port, which she did in gallant style, wind a head, she was saluted with repeated discharges of carronade and shouts from the spectators on the beach. Mr Inglis and a small party of friends were present and spent the evening in greatest hilarity and good humour, drinking success to the harbour of Kirkmay with a number of public and local toasts in a tent erected for the occasion. Fife Herald. 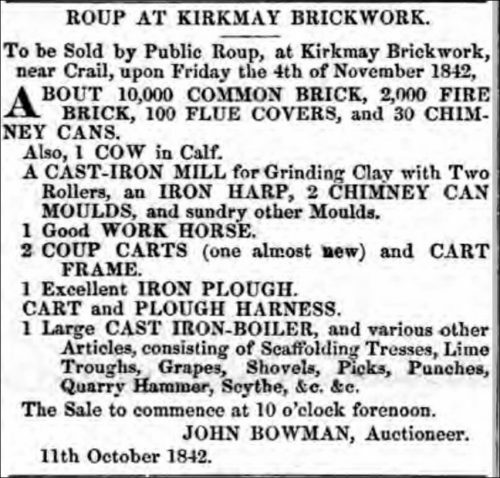 13/10/1828 – Fife Herald – Roup at Kirkmay Brickworks. 10,000 common brick, 2,000 fireclay bricks, 1,000 flue cones, 30 chimney cans. A cast iron mill for grinding clay with 2 rollers, one iron harp?, 2 chimney can moulds, sundry moulds. 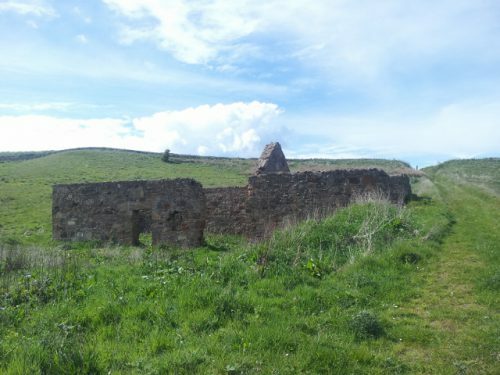 17/04/1836 – Fife Herald – Roup of Kirkmay Brickworks – the whole apparatus of a brickworks consisting of an excellent mill and brick, tile and pavement moulds etc. 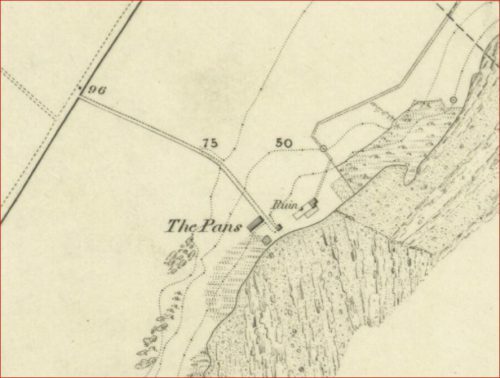 There seem to be occasional mentions of the export of brick/tile from Crail harbour without specifying works – Old Crail (Eric Euson p32) The Kirkmay House in Marketgate was built in 1817 for James Inglis who owned the Kirkmay estate. In 1845 it was reported he had formerly operated a coal work on his estate with an engine to keep the workings pumped free of water, but had given up the enterprise. Fire and common clay were still dug in abundance on the estate and fire clay bricks and chimney cans were manufactured on the Kirkmay estate and shipped to Dundee, Arbroath and other towns to a considerable extent. The 1841 census the Garrie family were living at “Kirkmay Brick Work”: there are three adult males at the address and 2 young women: trades are only given for 2 of the men: David was a mason and John was brick moulder. 7/12/1849 – Dundee Perth and Cupar Advertiser p3 Advert: W Bayne intimates he has resigned the manufactory at Kirkmay brickworks and thanks his supporters for the last 7 years – Crail November 27 1849. In 1851 David Young and his family are living at the “Kirkmay Brickwork”: his trade was brick and tile maker. 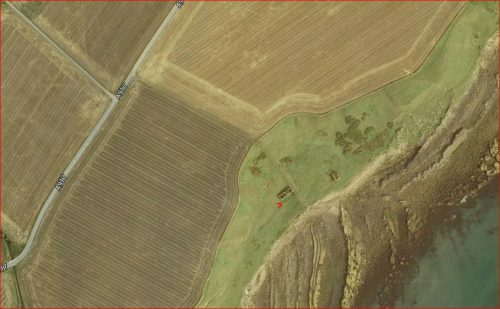 The photos below largely detail the old salmon bothy which sits very close to the current shoreline. Salt was once panned here. 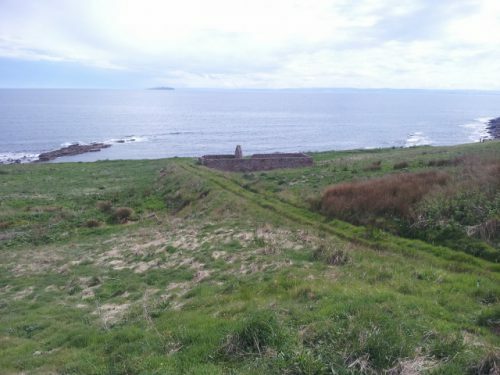 About 300 yards further along the coast from Crail sit the ruins of Kirkmay Brick Works. A ramp leads from the brick works inland to the main road. This was used by carts serving the works and transporting the manufactured goods. 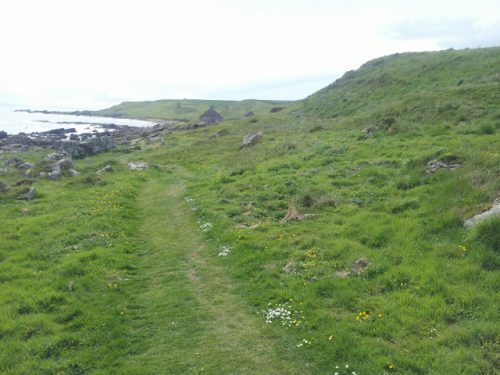 – Source Crail Museum Trust. The consensus of opinion from the Trust is that when the salt works industry died, the brick manufacturer took over the buildings and started to dig the clay and manufacture bricks.It is surprising though that none of the later maps have recorded the site as the Kirkmay brickworks – or is there such a map that I have missed. When I visited there was no obvious signs of the site of any kiln, nor burnt or misfired bricks which are usually evident somewhere on such sites. I will revisit when the undergrowth has died back to see if there is any such evidence lying around. It could of course be that clay only was removed from this site and transported to an unknown kiln site elsewhere but nearby – just a possibility. Below right – view of Kirkmay Brick Works from the shore showing the track cut up through the slope to the road (A917) beyond. Below left – view of Kirkmay Brick Works from the shore showing the track cut up through the slope to the road (A917) beyond. Below right – view of Kirkmay Brick Works from the top of the slope behind the works. Below left – view of Kirkmay Brick Works from the top of the slope behind the works. The old salmon bothy is to the left. Below right – view of Kirkmay Brick Works from the top of the slope behind the works. The old salmon bothy is to the left. 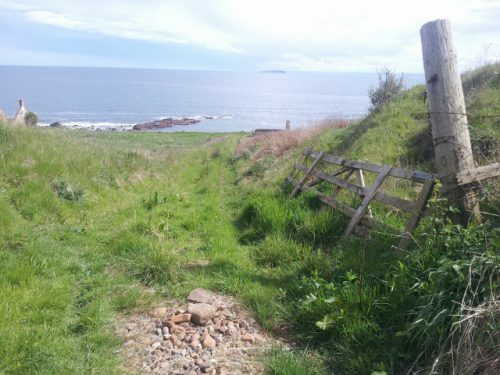 Below left – a view from the Kirkmay Brick Works back towards Crail and the Salmon bothy. 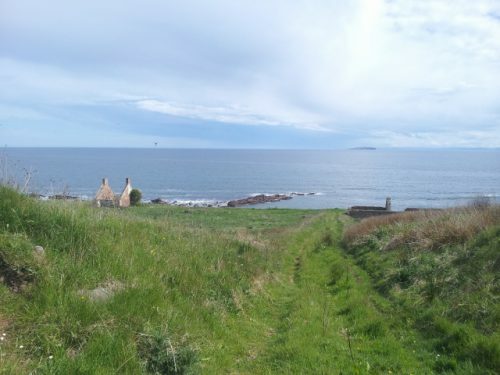 Below right – a view from the Crail side to the salmon bothy. 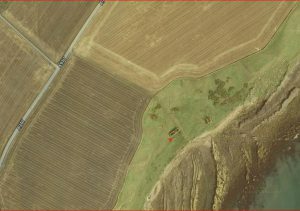 Below – Kirkmay Brick works and salmon bothy from above. These were found at the old Kirkmay Brick Works site. 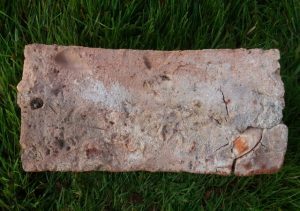 2 x unidentified bricks found at Kirkmay, Crail They are unmarked but it is highly likely they are a product of the works. The 2nd brick shows a large stone found its way into the clay mix and what looks like straw marks or similar…. 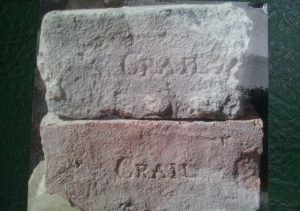 Kirkmay Brick Works, Crail Photographed in Crail Museum, Fife. A fantastic stamp on a chimney pot. . . . . 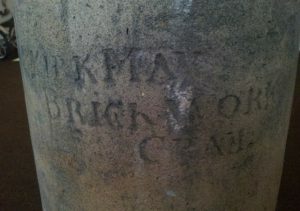 These examples are not in my possession Kirkmay Brick Works, Crail Photographed in Crail Museum, Fife. . .